Our PSI Official Round Notary stamp is sure to make your job as easy as possible. This pre-inked stamp allows for quality impressions every time with just a push. This PSI stamp is made with 40% recycled plastic and is environmentally friendly. Your stamp is guaranteed to meet all state board specifications and arrive to your a timely manner with our fast turnaround times. 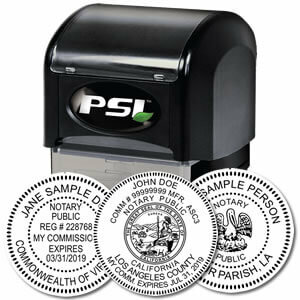 This PSI Pre-Inked Round Notary Stamp will meet all your needs as a notary public. Whether you're on the go or notarize documents at work, this portable PSI Official Round Notary Stamp will get your job done. Our PSI round notary stamps are pre-inked and handcrafted through a flashing process that differs from a self-inker. Your PSI Notary Round Stamp stamp will always leave you with the best impressions. Some states ask a lot of their notaries. It is important to contact your state board or diligently read through your handbook before ordering your supplies. We can guarantee that any notary public seal produced by us will be in compliance with your state specifications. However, it is important to know which model of stamp or embosser will work best for the type of documents you will be authenticating. The PSI Pre-Inked Round Notary Stamp is an absolute must-have for those states that require their notary publics' seals to be photographically reproducible.